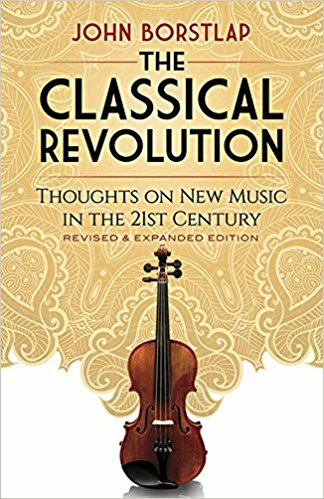 In the next few months, I’m planning to write a lot in response to The Classical Revolution by John Borstlap, easily my top recommended music book of this decade, originally released in 2013 but republished in paperback last month, and now available at a reasonable price worldwide. I am broadly sympathetic with Borstlap’s central thesis: that we make a category error when we refer to atonal “sound art” as “music”, particularly when we try to stuff it in to the institutional framework of classical music. Borstlap claims in his introduction that he is not out to make a rigorous argument in defense of this thesis, but rather to write a series of examinations on this theme. In truth, he tries to have it both ways and some of his argumentation works while other times it falls down under scrutiny. Tonality is the relationship in terms of resonance that exists between separate tones, a relationship made possible by the physical phenomenon of overtones. In every tone, other tones softly resonate; above the fundamental tone these overtones are in the order of octave, fifth, again octave, third, again fifth and smaller intervals which spread out in an increasingly diffuse and faint range at the top. This relationship is like a force of gravity which pulls a sound toward its fundamental tone. In a musical work, a fundamental tone could be compared to the vanishing point in figurative painting: it is the point to which all the lines of perspective and all the objects in the “virtual” space of the image are related, thus creating the effect of space in an otherwise flat surface. In a comparable way, the fundamental tone is the focus of all the relationships that operate in a piece of music at a given moment, and since music moves in time and all the different tones move according to the parameters of melody, harmony, and rhythm, they continually shift their relationship toward the fundamental tone, in continuously varying degrees of distance and strength of connection, thus creating the effect of energies moving along between fixed, less fixed, and floating positions. The result is what metaphorically could be called an “aural perspective” in which the force of tonality, with varying intensities, continuously focuses upon the fundamental tone: a “musical space” comparable to the quasi-physical space created by perspective in a figurative painting. The gravitational force of tonality makes the scales – the basic materials of music – possible and the simultaneousness of different tones forming a coherent unity: harmony. These differences of correspondence can create the impression of energies flowing from one type of intensity to another and can thus be used by the composer to create a musical narrative that gives the impression of movement, and thus a musical rhetoric is made possible. What I especially like is that Borstlap’s definition of tonality is quite a broad one which basically includes all traditional musics and excludes only one thing: the recently contrived atonal sound art of the 20th and 21st centuries, in which composers must strenuously work to avoid the use of tonality. But the tone system of Western art music is not exactly the same as the interrelatedness of natural overtones: it is an adaptation, an artificial structure within which the natural interrelatedness – the tonal “gravity” – can function, binding tones together, but with enough flexibility to make all kinds of tonal complexity possible. Tonality is not this equalized, flexible system in which the music can go in any direction, but is the “gravitational force” created by the relationships of octaves and fifths, gradually weaker in smaller intervals, a natural force operating within this human construct. Tonality – the binding force created by nature – is a flexible and ambiguous force. It is a field of energy and not a “structure” or “system”, and when seen as such it will become clear that the idea of trying to create an art music without tonality is inherently absurd. A form of music which is not organized on the basis of the “gravity force” of tonality is not music at all, but something else. It is indeed nothing less and nothing more than “sounds art” or “sonic art,” an art form typical of the last century and which does without the entire range of communication and expression that had been the normal territory of art music for ages. In comparison to a past golden age of strongly expressive masterpieces, it is no surprise that even the “best” sonic art is not of much interest to people who love music. Sound as such is different from music because music transforms sound into emotional, psychical expression, it goes far beyond its physical presence, while sonic art stops there. This difference goes down to the heart of the concept of musicality itself: musicality is the capacity to understand what a musical work does, which is creating a mental space in which the musical energies move in forms, narratives, and flows, and which can be emotionally experienced by both the performing musician and the listener. Forms, narratives, and flows. I just think that’s a brilliant choice of words. [Though, ironically, it could EASILY be the title of a new piece of atonal sonic art.] It succinctly sums up so much of music: forms like sonata, rondo, AABA; narratives like tone poems, heavy metal ballads, or ragas; and flows like minimalism, drumming patterns, or ragas. And that’s the thing – most if not all music is some combination of the three. Certainly most Western art music combines forms, narratives, and flows. Look at the Pastoral symphony as an obvious example. Much of that piece is based off of the repetition of short melodies and motifs which can only be described as flows of musical energy; and yet, these flows are bound within the structure of a form and the form itself is at the service of a musical narrative. Well that’s enough gushing about this book for now. You go read it, and while you’re doing that, I’ll get ready to tear apart the parts that I don’t like in my next post.